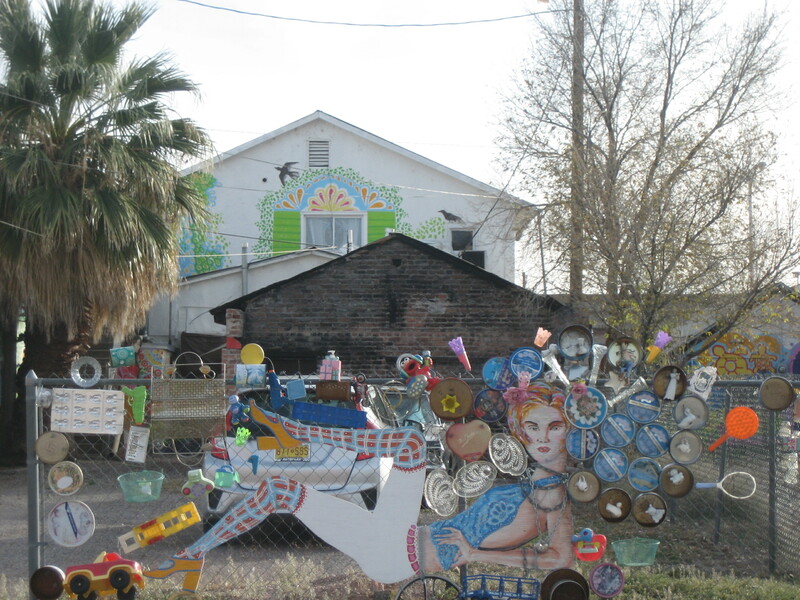 Walk around Truth or Consequences, New Mexico, and you’ll see not only galleries full of art, but art covering the walls of buildings and decorating the alleys. I’ll get this party started by sharing my least favorite piece of public art in Truth or Consequences. This is a tile mosaic on the front of the Bank of the Southwest at 509 N Broadway Street. 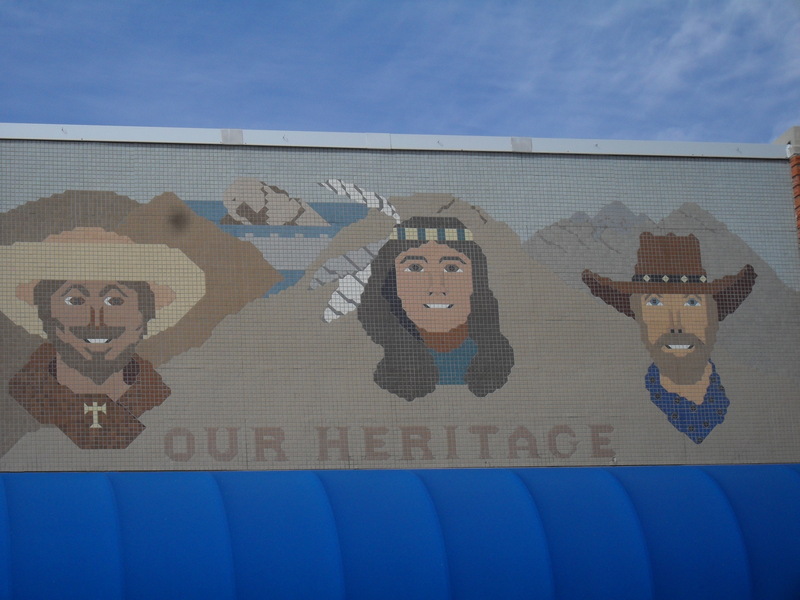 It’s a nice enough (although somewhat bland to my eye) mosaic, except for the caption, “Our Heritage.” Sure, it’s supposed to be inclusive, with the Spanish Catholic guy on the left, the Native American fellow in the middle, and the white cowboy/rancher man on the right, but what about women? Did only men play a role in the heritage of Truth or Consequences/Southern New Mexico/the Southwest? I think not. I roll my eyes every time I see this piece of work that renders invisible the women who played a role in the town’s history. A piece I like more is this one, located in the alley behind the storefront on Broadway that once housed the CHF thrift store. Notice the mural around the windows of the white house in the background. 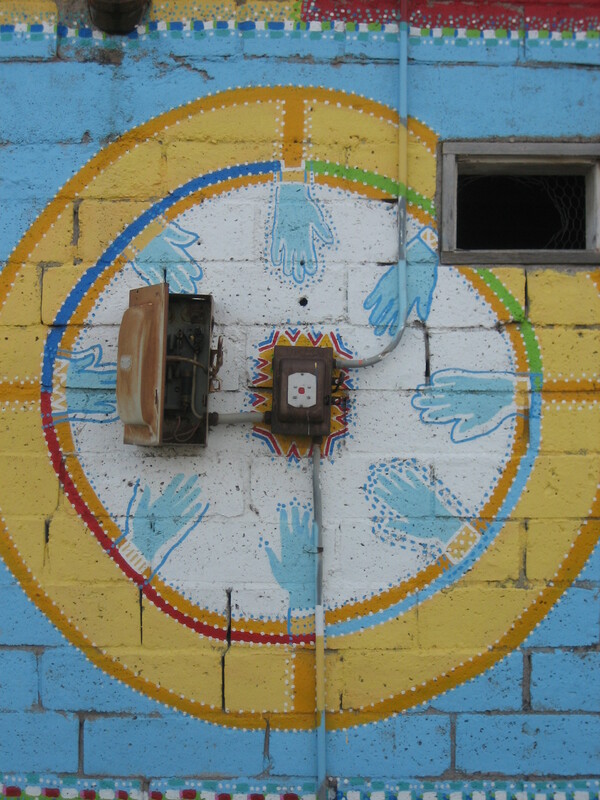 Mural and mixed-media piece by Mary Kinninger Walker. 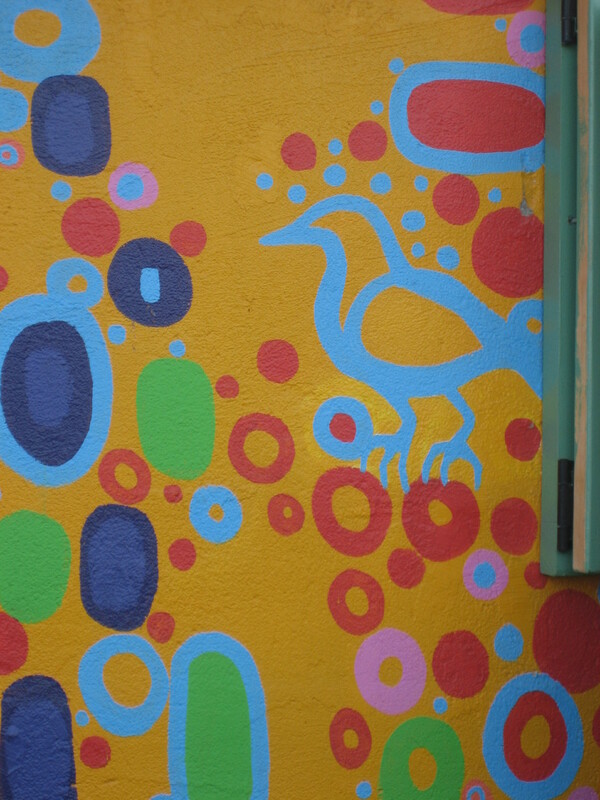 Detail of the above piece. I like the smaller objects attached to the metal lids. 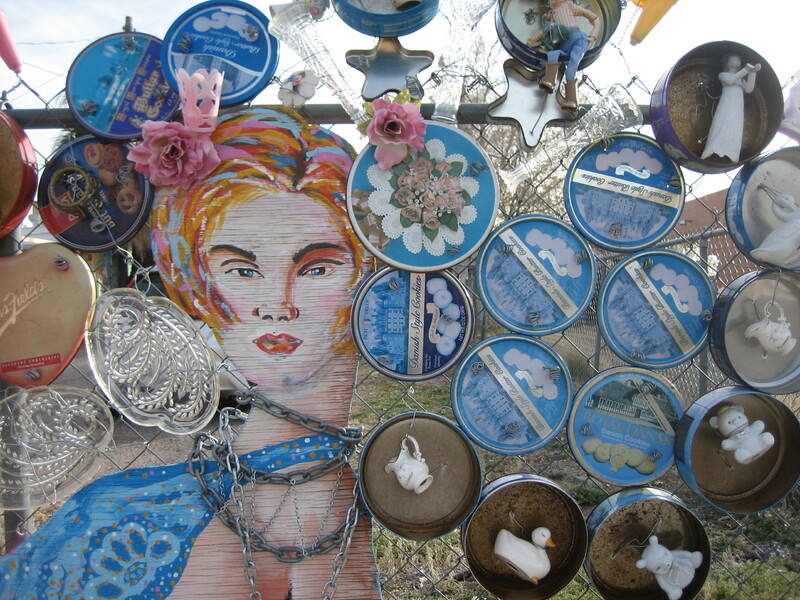 It’s a mixed media, found object, three-dimensional collage. For a long time, I didn’t know who’d done this piece, but two readers wrote in and told me the work is by Mary Kinninger Walker. 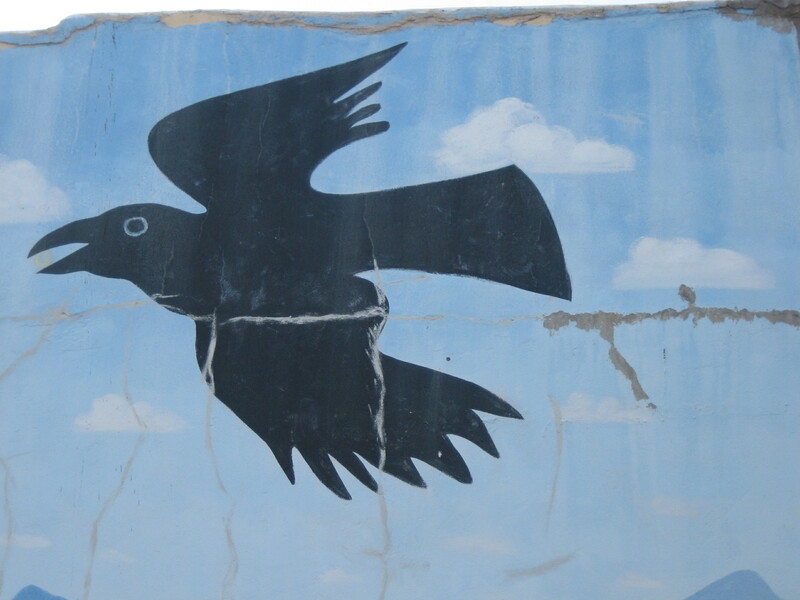 Another mural I like is this one of a black bird (crow? raven? I can never tell the difference) on a building on Main Street, near the Passion Pie Cafe. I like those puffy little clouds against the light blue sky too. According to the Spring 2015 Sierra County Artist Directory (volume 13), the bird and the sky were painted by Bonita Barlow in 1999. I also like this painting of the Virgin Mary. (Love those spirals on her cheeks!) 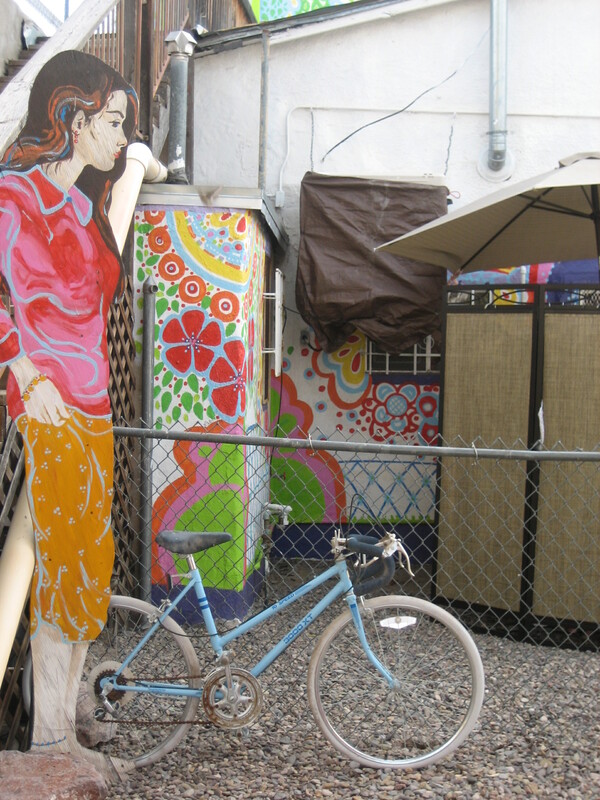 She’s painted on a building that’s behind a hurricane fence, so was difficult for me to get a good shot of her, but she is surrounded by color and intricate patterns. The Virgin was also painted by Mary Kinninger Walker. 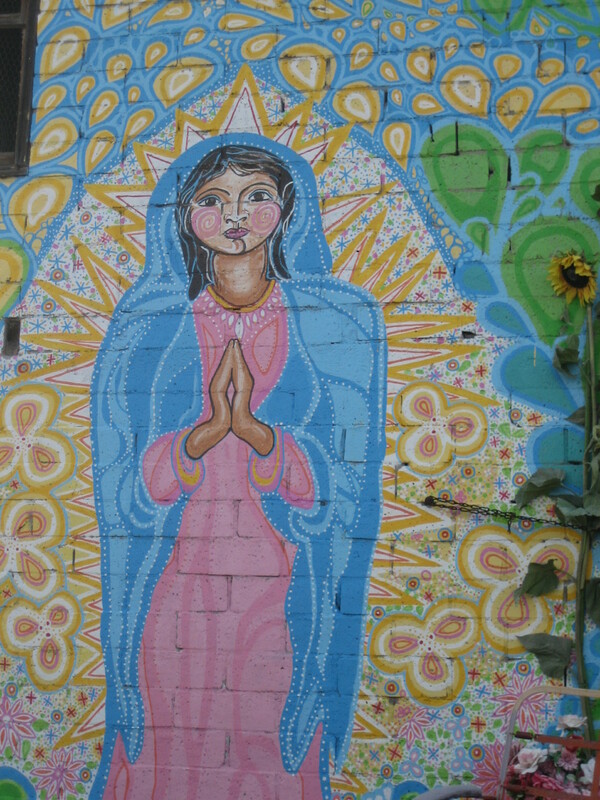 Perhaps this manifestation of the Virgin was painted by one of the artists mentioned on the Sierra County, New Mexico website (http://www.sierracountynewmexico.info/attractions/art-in-truth-or-consequences-hillsboro-and-more/). 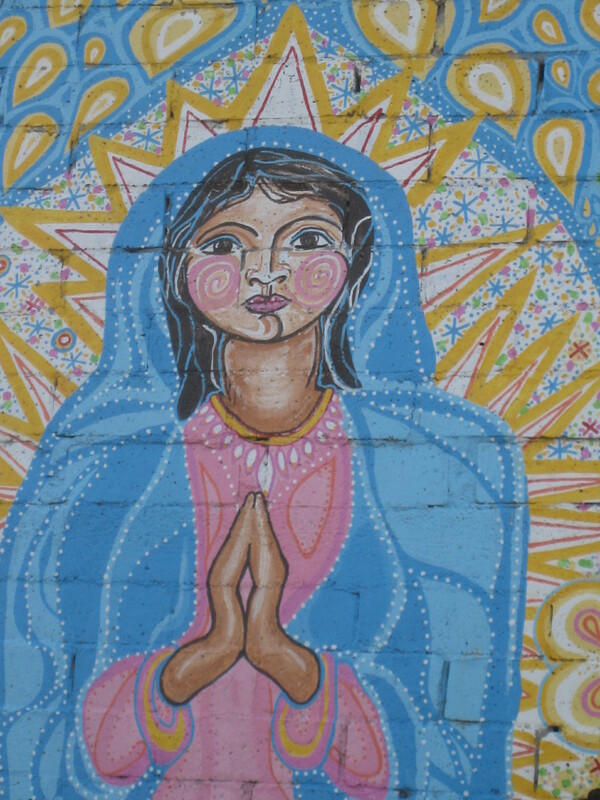 Truth or Consequences is also home to a growing number of outdoor murals; you’ll find them painted on bath houses, shops, homes, and even vacant buildings located in increasingly colorful alleyways. 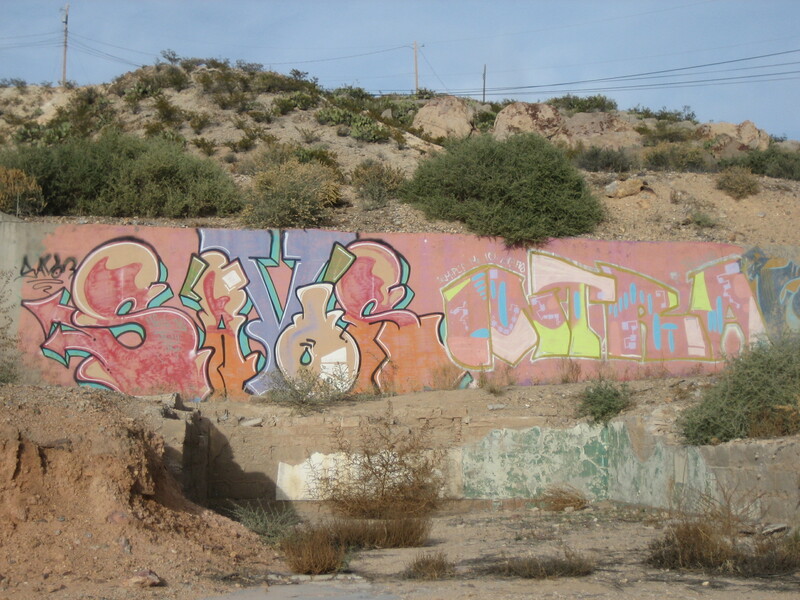 I wish that website had shown some of those murals and shared the name of the artists. I took the next three photos during my first visit to Truth or Consequences in March of 2014. 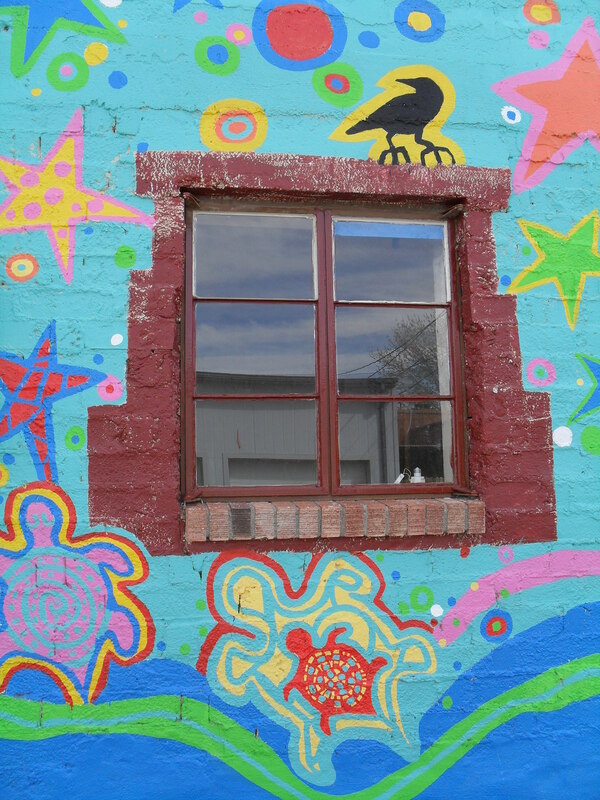 This mural is painted on the back of a building and can be seen from the alley. 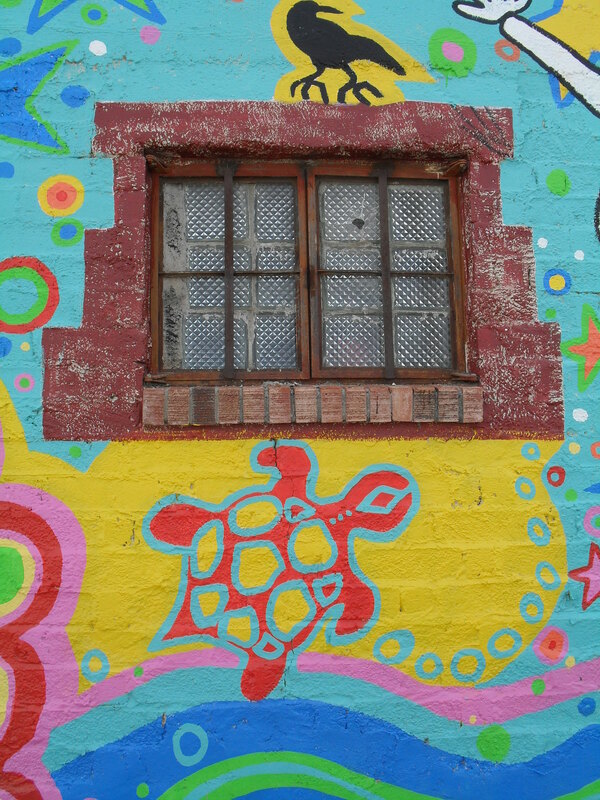 I was attracted by the bright colors, the turtles, and the skeleton with wings. 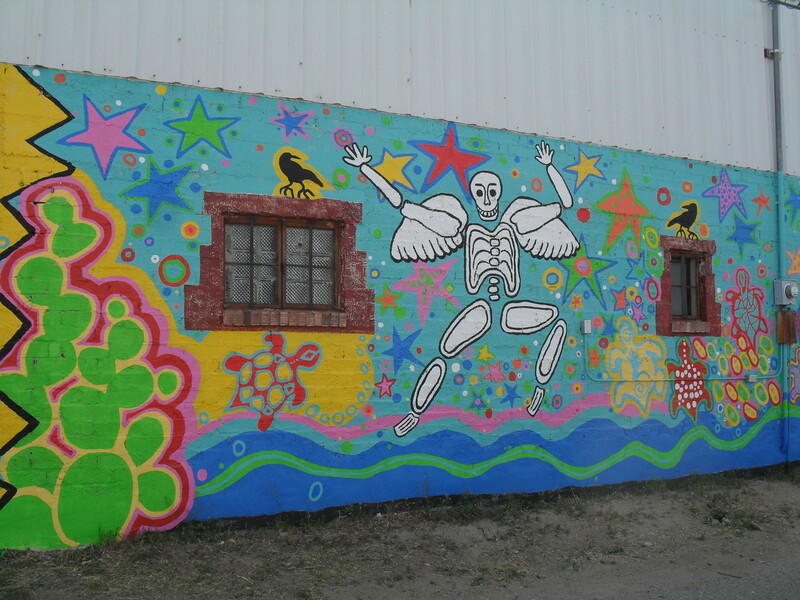 I found a photo of the skeleton in the above-mentioned Sierra County Artist Directory, and the piece was attributed to Mary Kinninger Walker and Donna Monroe. The next three pieces were also painted by Mary Kinninger Walker. All of these are located on the back of buildings and can be seen from alleys. 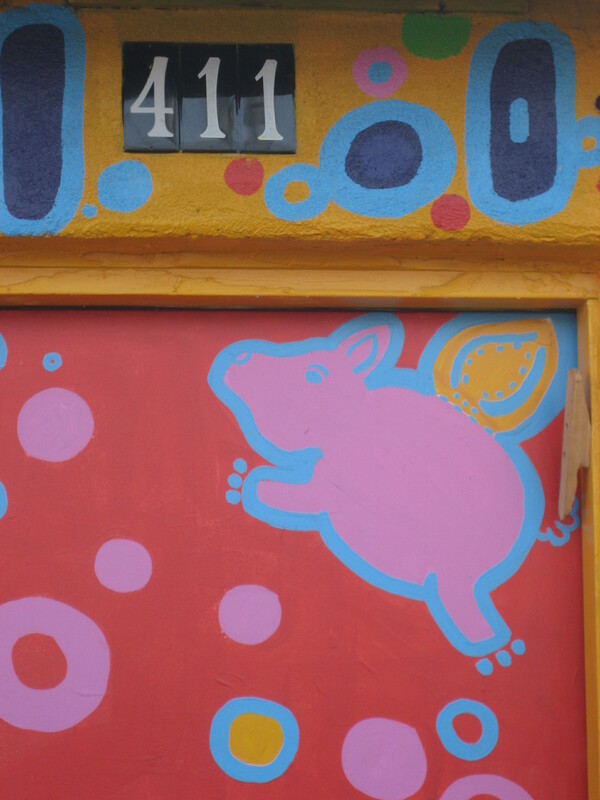 When Pigs Fly is a shop in T or C. I think this mural must be on what was the back exit to the store when it was located on Broadway. I like art that pretties up plain or ugly things. Love these super bright colors! These brightly colored pieces were also painted by Mary Kinninger Walker. 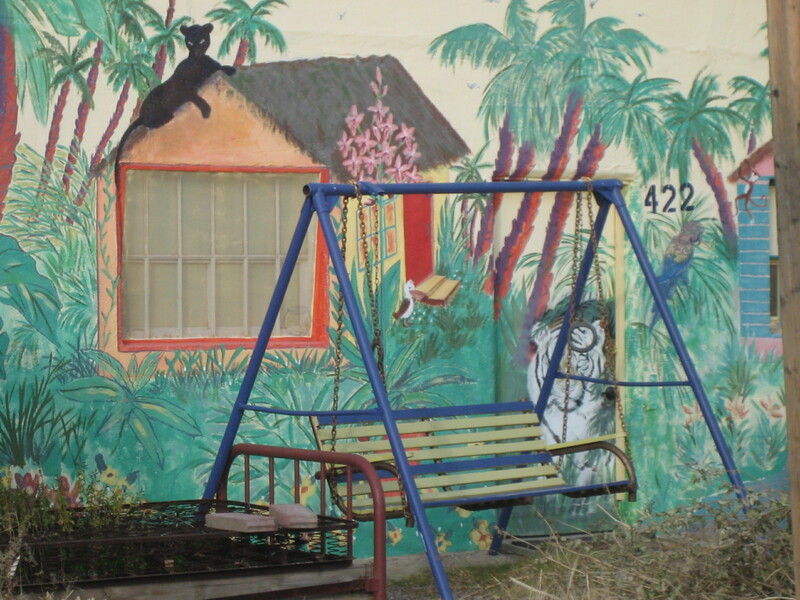 The photo to the left is a detail of a jungle-scene mural that covers the entire back wall of a building. (If I remember correctly, the front of this building is on Broadway.) I love the way the building’s actual window becomes the window of the jungle hut. I love the alert black cat on the roof of the hut. I love the way the swing fits right into the scene. Anyone know who painted this one? 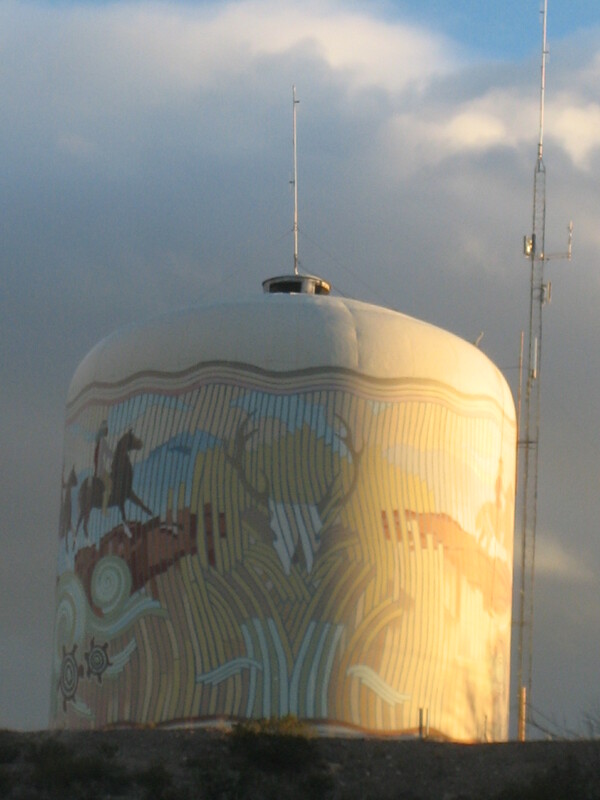 Artist Tony Pennock of Las Cruses, New Mexico painted three water tank murals in Truth or Consequences in the early 1990s. [This] One shows Apache horsemen traveling to rest at the hot springs. These tags are on a (retaining?) wall on Main Street, near the old post office and the Geronimo Springs Museum. I think graffiti is as legitimate as any other art form. 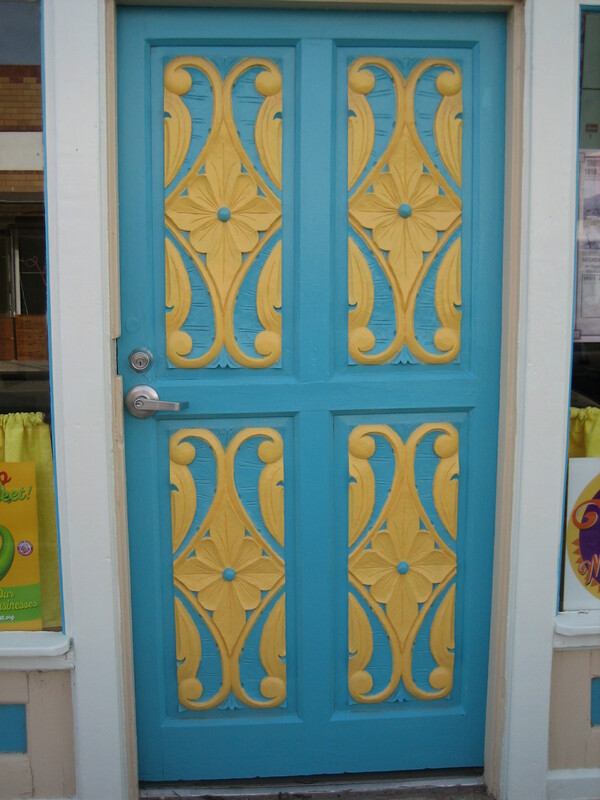 Sometimes art is functional, like this blue door on Main Street. I really like the intricate design highlighted in that soft yellow. I hope to go back to T or C someday and take more photos of public art to share here.